If you plop yourself down on a park bench in the U.S. and watch people come and go, you’ll undoubtedly see people of all ages meet and greet each other with a hug. Some are just friendly, quick hugs and others are more loving and romantic. Sometimes a hug is accompanied by a pat on the back, or swaying back and forth, and sometimes there’s a lot of distance between the two people. No matter the type, you will see lots and lots of hugs because it’s a common greeting among Americans. But upon arriving in France, I quickly learned there’s no hugging in France. You don’t hug to say hi. Not even family members. When I jovially put my arms around my French father-in-law who proceeded to just stand there like an animal playing dead, just waiting for his predator of a daughter-in-law to slink away. Ooops. I found out the hard way there’s no hugging in France. Let’s take a closer look at hugging in France (or the lack thereof). GO! So I’ll say this right out of the gate. You do not greet French people with a hug (unless it’s a child). You do cheek kisses, les bises. Sometimes it’s one on each cheek and depending on your social circle and region of France, you may go for 3 or 4 bises. 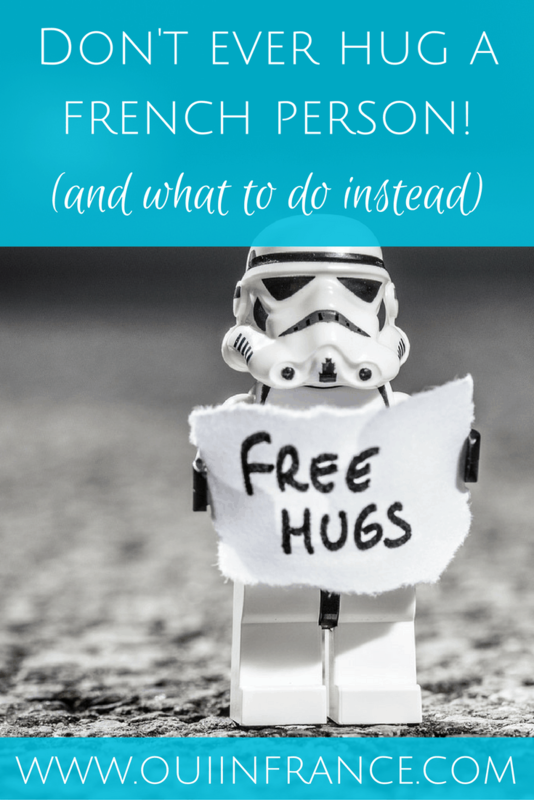 But whatever you do, don’t go in for the hug like I did with my poor father-in-law. 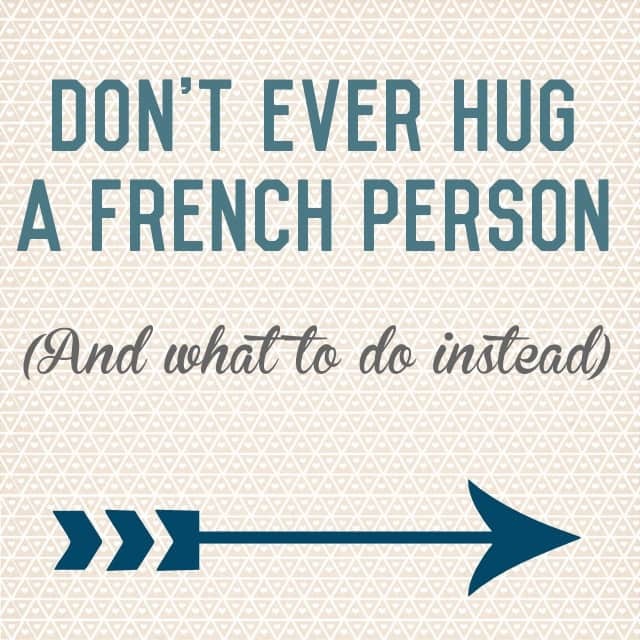 In fact, the French don’t even have a verb that means “to hug.” Well not in the same sense exactly. The closest would be to simply “take someone in your arms” or prendre dans les bras or faire un câlin but it’s kind of a romantic gesture. Like a tender hug you do with a romantic interest. Or something you do with kids. Or maybe someone going through a really hard time to console them. But hugging in France is never used as a greeting. They won’t know how to do it. Apart from what they see in the media, the French really aren’t skilled at the different types of hugging and have no clue when to use each for a greeting — but it’s not their fault! It’s not normal in French culture to hug, so if you attempt to hug a French person, they may get a little too close, too touchy-feely, might not know what to do with their hands or might just stand there like my poor father-in-law waiting for you to move on to the next unsuspecting Frenchie. It’ll make them feel really awkward or embarrassed. They might think it’s a come-on. You do quick cheek kisses, or faire la bise, instead of hugging in France to greet someone. Who do you do this with? Family, friends, sometimes colleagues and casual acquaintances you see often. Usually men don’t give each other bises unless they’re family or very close. What side do you start on? Who the heck knows. I don’t think there’s a rule but just about all the time I start with a right cheek to right cheek. Always follow the French person’s lead. It’s their country and they’re the masters of the French greeting. If they start to turn their head and scrunch their face, they’re coming at you for a bise, or cheek kiss or two. So if they lean in for a cheek kiss, do the same. And if you wear glasses like I do, it’s customary for one of you to remove your glasses so they don’t clink. I never do this because I’m lazy. If they start to extend their hand instead, do the same and shake their hand to say hello. Note that once you start to faire la bise with someone, you do it every time you see them. Not just once or now and then when you feel like it. It’s obligatory! Time to adapt. Just kiss me already. I still find bisous a little awkward and would much rather hug, but hey there’s no hugging in France so I’ve adapted. And when we visit my family and friends in the U.S., Tom knows they’re going to hug him and he’s cool with it. He’s a professional hugger now. Here though, aside from Tom’s family and my one French friend (who I cheek kiss sometimes when I’m feeling particularly French), I only faire la bise with two guys at the gym. One is the manager who I’ve become friendly with and the other is a nice guy who is always in the weight room at the same time as me. Aside from those select people, I just say bonjour. It’s not a romantic thing and is as simple as a quick hug. Peck and peck and done. So bam, there’s your lesson on French culture for the day. Don’t hug. Faire la bise. And everyone will live happily ever after. What’s your experience been with hugging in France and bisous? That’s interesting that hugging has become so commonplace for you that you actually miss it now that you’re in France! Hugging is great and I really do prefer hugs to bisous, but I’m American so it’s normal. Hugs really can feel sincere and heartfelt and I’m glad that you hug your son. Maybe we should start some free hug demonstrations! Hugs are OK in some families. It depends. Do it if you want and especially if you see it done. Otherwise, do what the French usually do. Two pecks on the cheek, one on each side. I think I still do the half hug w/the kisses. Where are we supposed to put our hands and arms during bisous? I really have no clue. But yes, very good that you gave them a little tutorial before they all met. And AHHH 4 bisous??? You can also take them by the shoulders, and kiss lightly both cheeks. The French are really quite ambivalent about how it is done, but they will be very surprised if the greeting in this manner is not done. It came easy to me, but I’m from an Italian-american family so it was no great surprise to me. In fact, I have cousins in Italy who will hug if they’ve not seen you in a while. Thanks so much for sharing your story and commenting. So happy you like the posts… and stay tuned, hope to film a video with me totally botching your name for an upcoming post. You’ll like that!! Asking Tom right now about etreindre. Never heard the word. Is it more common in Belgium? And oh man, I can just imagine you standing there frozen and stressed. Just like my father-in-law!! 1) Serrer quelque chose, quelqu’un, le saisir fortement en l’entourant de ses membres, empoigner : Le malheureux étreignait désespérément la bouée. 2) Serrer quelqu’un dans ses bras pour l’embrasser ; enlacer : Il étreignait longuement son fils retrouvé. 3) En parlant d’un sentiment, serrer douloureusement ; oppresser, tenailler : L’émotion m’étreint. So Tom said, “OH yeah, that does mean hug.” But it wasn’t the first thing that popped into his head. He said it sounds a little old fashioned. 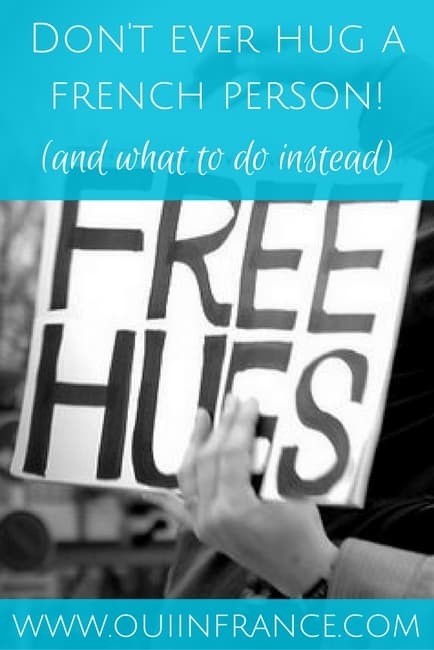 It’s weird because I’ve read other blogs about hugs in France and asked a few other French people and they told me there’s no real word for hugging aside from taking someone in your arms, prendre dans les bras and calin. Thank you for teaching me a new word! What were you doing in Japan? I forget if you told me this story. Do you speak Japanese too? Haha, this beats me every time. As a Brazilian, I’m very huggy and it’s just weird not to greet people with a hug. I soon enough told my parents-in-law how we greet with Brazil and they actually adopted the idea with enthusiasm! So we now always greet with a hug. Yesterday was our rentrée at college, and a schoolmate actually greeted me with a hug. It was my time to freeze and not know how to react! There are rare French people who can greet with a hug, I guess. She did live abroad, in Canada and Romania, and I guess that explains it. It warmed my heart up — I missed greeting people with a hug! Oh wow, perfect timing! So what were your friends’ thoughts on hugging? Do they live in Greece, been there awhile too? Hope that goodbye hug went OK. Do Greeks hug to say hi/bye? Yes, my French friends live here now for a few years each but they are from France. They totally agree that hugging is a strange thing for them. The goodbye hug attempt by me was a silly joke– he he. They are used to such things by me. Anyway, she refused and we giggled about it. Greeks do not hug either. They totally prefer the cheek kisses! Great article! I’m learning French and LOVE learning more and more about the culture and the people. Awesome, so happy to have you here! How long have you been studying French? And have you been to France yet? I have pretty much gotten my French in laws and family used to my hugging. My mother in law was the proverbial frozen post the first time i hugged her, which was the first time we met, prior to her daughter and I geting married. Being Italian and Spanish we have always hugged in my family and friends. It is a sure way of freaking out people you’ve just met though. Usually my wife will warn her friends about my habit, lol. At least they are not scared of me anymore. Hahha, glad I’m not the only one who scared a new family member. And it’s very nice of your wife to warn her friends! I miss hugs too! Sometimes I don’t want someone up in my face for a bise. You can come hug me hahaha is that weird? That’s kind of you to offer, JF, but I think if you’re French and in France, it’s us Americans who need to adapt to you! 😉 Although the occasional hug would be cool. Have a great weekend! What terrified me was your remark that ‘Note that once you start to faire la bise with someone, you do it every time you see them. Not just once or now and then when you feel like it. It’s obligatory!’. It reminded me of when I was attached to a prefecture, in the South shall we say, and, every evening at 1900hrs, staff met with M. le Prefet/M. le Commissaire… to coordinate the following day’s festivities. Having a very poor memory, I can very nearly remember the pained expression on the face of one chap in the line-up before the fireplace, whose hand I attempted to shake as I passed along the line. Alas, we had already met and shaken hands that day and a second handshake clearly reflected what an inadequate impact the first encounter had made (on me). I would be in terrible trouble remembering with whom a bise had been established as the customary greeting. My prefectural exploits did not end there: one day I accompanied M. le Chef de Cabinet to review the fire brigade Etat Major Departemental, all lined up and all hands shaken by MlCdeC. Alas, being a shaken handshaker already, and a retiring type, I unerringly felt my relative unimportance in this ceremony and hung back, only to find MlCdeC at the far end of the line. I then had to demonstrate my moseying skills in front of the assembled brigade to rejoin him at other end of the line-up, so we could be entertained to lunch. Hi Luis, thanks for your comment! I think we’ve all had “oops” moments like you describe. Even in the US, I’ve said “nice to meet you” to people I’ve already met, or not recognized someone out of context or when they wear glasses (normally don’t), etc. It’s just that much more mortifying when it’s in our “new” culture, right? Or maybe we get a pass. haha I don’t know. But I feel your pain. I don’t know how French people remember who they faire la bise with and who they shake hands with and all the rules to go along w/the greetings. Are you still in France? No longer in France, hélas, hélas, trois fois hélas. I’m hoping to get back for a few weeks some time this century. I am fascinated by cultural differences, including spending a week with a sister who with most of her family has now been in Chicago or thereabouts for over 20 years, so both of your contrasting expectations are of interest. I look forward to your addressing the baise-main. I recall attending a wine evening (family vineyard) in Paris to which we had been invited by our children’s school friends’ parents (still with me? ), where it was clear from the way women’s hands were extended and the response of most men arriving, that a baise-main was the way to go and the response of foreigners was being tested. This was 35 years ago :-). my god, I laughed so hard picturing your poor father in law. You understand us very well, it is exactly that ! Thank you for hosting the linkup and so glad you enjoyed the post. Yes, I’ve seen very close family members hug here and there but usually after someone dies, like to console them. Maybe it depends on the person/family for that sort of thing. Have a wonderful afternoon! I loved this post! Every English person travelling to France should read it. You quite simply DO NOT HUG the French! 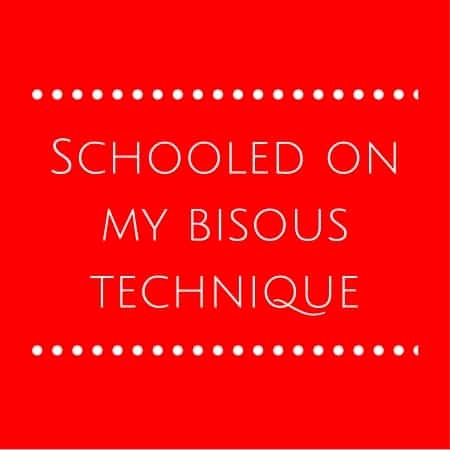 They all find it so awkward, probably as awkward as everyone here finds les bises I enforce on them wherever I go, haha! Yes, that can look a little weird at first. Even in English, I never say hugs. But I totally know what you mean! On the phone too, bisous before they hang up. I wasn’t much of a hugger when I lived in England, apart from my kids, but since I’ve moved here I’ve grown to love the hug. Almost exclusively because my circle of friends have now accepted me so much that even the men kiss me!! A minefield! We don’t really hug in Australia either I don’t think,. It is more common these days to kiss on one cheek, but old people still shake hands (or stand off and wave if you are from the country … only kidding). Interesting to read the comments about Japan – I worked there for a Japanese company. I started to feel uncomfortable when foreigners would come and try to shake hands. Everyone is much more relaxed when they can stand apart and bow. Hi Sally, I didn’t know that about Australia. Yes, Aurore’s insight into Japan is fascinating and I agree with you. It’s easier to be relaxed when there’s a physical distance between people. 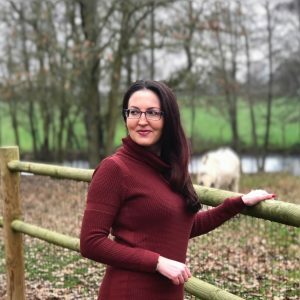 Thanks for checking out the post! Uh oh. I’m racking my brain to remember if I’ve ever hugged a French person, not knowing that it was a faux pas. I’m pretty sure that I’ve followed the lead of the French when I meet them. I’m OK with bises (in fact, like them), so I’m probably safe. Left or right is a good question. I’ve been starting with the left and it’s worked out so far. That’s an excellent strategy. You can never go wrong if you follow the French person’s lead. I go left too and so far so good! I was an exchange student in France for a couple weeks last summer and the bises took some getting used to! When I first met my host family I hugged my host mom and she took it very well and didn’t say anything about it. Which made it more surprising when host dad went to give me greeting kiss and totally scared me! (I should have researched more!) From then on, when we all meet up with their many friends he would start laughing as I awkwardly kissed ten or more people XD A couple people even politely took their glasses off before a bise so I would clank mine with theirs! Thanks for the lovely and hilarious post! I’ve always wondered though, what do French people think or say out loud when they see Americans hugging all the time on TV and even print media in a non romantic way. Are they grossed out by it? Can you shed some info on this? Maybe it’s because we live in the south of France, but my family and friends are quite touchy-feely, and we bear-hug all the time. We just don’t do it with strangers or poeple we don’t know very well. I’ve just read your post , in fact I’ve never heard anything at all, I suppose we, french take it as something people do period . 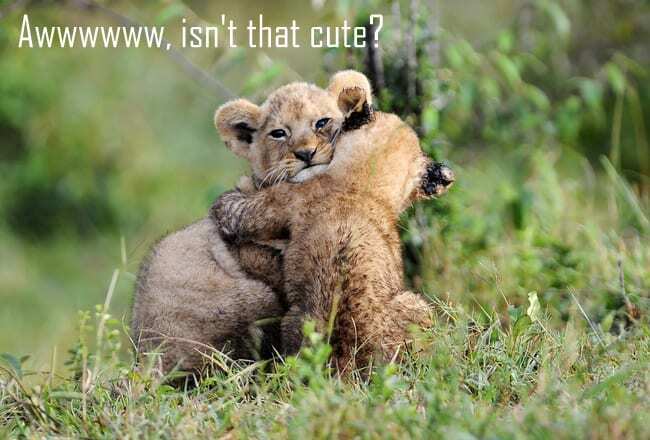 For my part when I see people hugging I think ” ol how tender this gesture is ! ” its in fact moving. And also why aren’t we french capable of showing as much loving.on the hand we are very closeknit families and get together a lot . Our Love is shown in having long moments eating around the table sharing our joys and sadness . With friends we are more reserved and meet them just for the fun and play practical jokes all the time , but if a friend is in need then we are there for support of course. On the whole we don’t mix family and friends . Hugging in France implies romance only . Contrary to Solane, I am not from the south but from the northern half of France, where people are much more reserved about chatting and touching other people. I don’t really know how it is in the south, but in the north, you don’t always “kiss” women and men rather shake hands even when they are friends, or just say “hello”. We never do ‘bises’ on formal occasions, like meeting our boss or colleagues that are not close friends. I have never found it gross or strange to see Americans hugging each other in a friendly manner on TV series, although I don’t remember seeing them hugging people that are not friends. I guess that would feel strange to me. When Americans hug each other, it seems normal to them, therefore it seems normal to me. Seeing it is fine, but doing it is quite different ! I was hugged one or twice by Anglo-Saxon people I knew and that was really awkard. I just stood there like Diane’s father-in-law, was extremely embarrassed, tried to hug back, didn’t know how to do it and wondered all along how I was supposed to react although I tried not to show it ! When it is done by men, it adds to the embarrassment because this is really close contact : actually, nobody hugs me except my fiancé. ‘Bises’ are much less close because the only part of our bodies that meet is our cheeks. We don’t actually kiss people : we just approach our ckeeks from one another while making a kissing noise. Applying one’s lips to another person’s cheek would be a ‘bisou’ and we generally do that to children we know. That would feel strange to some children to be kissed by strangers. Very true ! In my mother’s family who is from Normandy, people always kiss twice, but my father who is from Picardy does it four times. I have become very close with a French guy. I knew not to hug French strangers. He just came back from where he lives, so I tried to hug him today. I thought we were close enough for him to cope with that, but he just stood there. So, lesson learned. Even if you are very close, hugging is still not acceptable haha! Hello! I’m a teenage girl and I will be going on an exchange type trip to France over the summer. I was wondering if it would be in place to “faire la bise” with my exchange family the first time I meet them. Will it seem awkward or is it wrong to go from a teenager to an adult? Thanks. Hi Olivia, Yes, you should absolutely get prepared to faire la bise with your exchange family! That is what will come naturally for them to do. Keep in mind, that you won’t know in advance what cheek they start on or how many to do. Some people do 2 kisses (Parisians, in particular), and in the south they do 3 or 4. If there is a exchange program director, he or she may also greet you upon arrival, in which case you would faire la bise with that person too. As a female teenager, you will likely faire la bise with your French family, their extended family, teenagers or children you meet to spend time with, the parents of your teenage friends, etc. People you would not faire la bise with: a doctor, a store clerk, hotel staff, etc. As a female, you will faire la bise with both men and women (of any age). Males will shake hands between males, but males and females font les bises. I had NO idea! 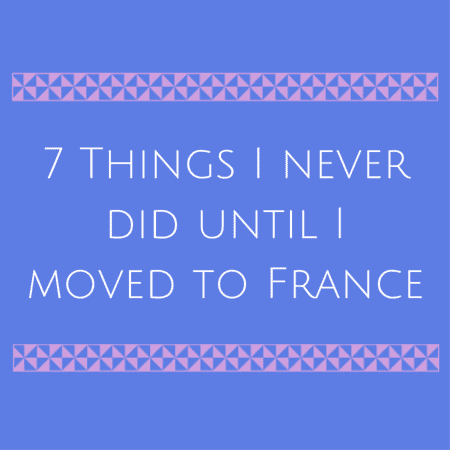 but now I do, and its probably a good thing since I hope to travel/live/work in France for a few months at some point in the next few years! Sometimes younger people are more open to hugs and see them in American films but it’s definitely not the standard greeting! ( in arms). other définition anyone? My experience is quite the opposite. I’m from South America. I went to college in US, and to my standard Americans hugs seemed to fake and cold to me. In fact, I struggle that most of the time they would completely ignore saying hi and making eye contact. Years later I married a French and I was bothered by having too much hugs (and off course kisses) from her family! They are from the south of France. And all my wife’s friends love hugging. 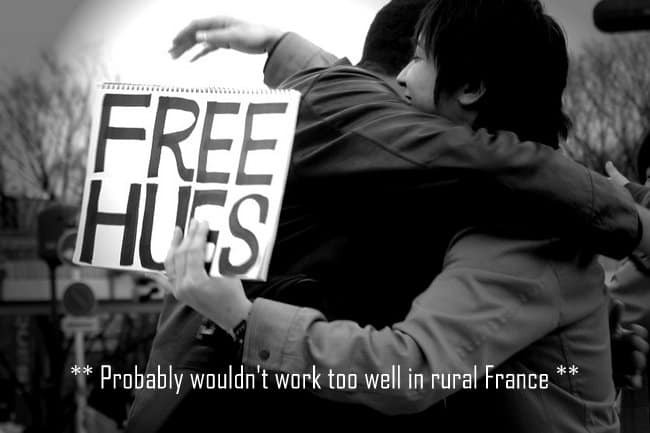 Even once, when I was visiting Ales, I saw some French holding free hugs signs and giving hugs at the local market! Hi Cris, I guess it depends where you were in the States too. I live in the South, and in my area everyone uses hugs. You meet a person twice and instantly you are on a hugging basis. It shocked me at the beginning, especially if, for example, my financial advisor hugs me in front of his secretary… Awkward!!! author asked for his comment to be deleted. So happy you enjoyed it! Have a great trip — what area(s) are you visiting? I hear it’s a great city. Enjoy! I grew up in London and hugging was not part of the culture. One kiss on the cheek was acceptable with friends and family, a handshake for acquaintances. When I moved to America and encountered the hugging culture it was awful to me. I didn’t much mind men hugging me, and even some of them I wanted to keep at arms length, but other women hugging me was the worst thing. A rather large friend would envelop me and I froze. She rather got the message and stopped. I cringed every time a woman would want to hug me. I was there 24 years and never got used to it. Coming to France where they touch cheeks felt right to me, it is friendly but not too intimate. I really like that the children are brought up to greet adults. Our grandson came here as a seven year old and now, a teenager, he naturally shakes hands with all the men and kisses the women without any embarrassment or urging from us. He learnt that at school, where on entering the teachers were waiting for the children, the female teachers kissed the children and the male shook hands with them. 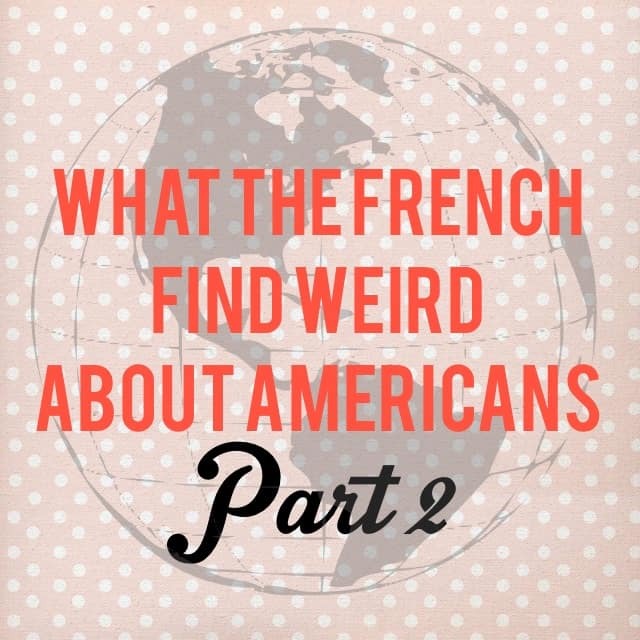 I teach French 1 in 8th grade in the US. 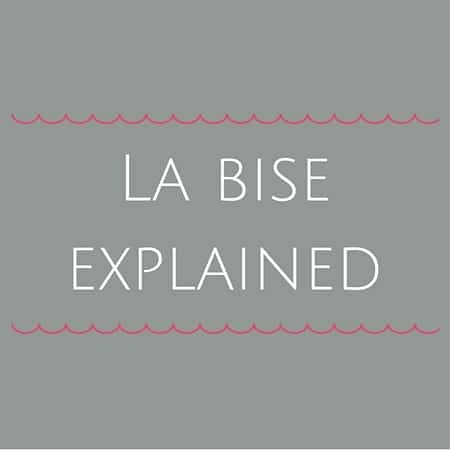 You can imagine the laughter and giggles when we talk about la bise with kids this age!! Your article was so perfect and gave me such great insight on things I can share with them (I have never lived in France, just studied). Thanks so much for sharing this fun culture difference! It really helped me a lot!!!! Hi,I log on to your new stuff named “Hugging in France: Why you don’t hug a French person” daily.Your story-telling style is witty, keep up the good work! And you can look our website about daily proxy. I am currently studying abroad in France. I have one more month left and I miss hugging so much. I’m not a person whose love language is touch but I didn’t realize how much hugging meant to me. The bisous are okay if they initiate it. I never know when to do the kisses so it can sometimes be awkward. The first time me and a guy did a bisous I thought he was going in for a hug so I half hugged him until I quickly realized my mistake. I pulled my arm away very quickly. I loved this blog piece it was very insightful and helpful to know I’m not alone in this lol. Oh how I wished I had read your informative post before my trip to France, I’m a big hugger – I even hug my bosses on their birthdays! My friend and I went to a music festival there recently and it was our first time in France. The security agent there were so kind and helpful when I lost my phone and really took a lot of trouble to help me to find it in the huge crowd. He didn’t have to, they were all just really nice guys. I was almost hysterical because my boarding passes, credit card details, everything was on that phone. When he returned it to me I was so relieved I said “Can I give you a hug?”, and he looked mortified but later after the festival when I thanked him again he was like what the hell and let me hug him, so I gave him a big bear hug. I am beyond mortified to read that it is considered a come-on in France! !